The other day, while I was in the midst of my daily activities I was struck by a sudden thought. This is not an unusual occurrence for me. I really like to think about things. Some would say overthink things. I prefer to say I like to mull over things. I’m afraid they are not always deep thoughts. I would like to say that I ponder over the theories of existentialism, being and nothingness and Newtonian principles, but more often than not I wonder what’s for dinner, whether I can go another day without washing my hair or what to paint in my journal that night. Then I got to thinking about my new blog escapade and why I like to document what I read. Even when I was a child I used to keep a book diary of sorts. Each page would have the title of the book. The author’s name. A hand drawn illustration about the book- a necessity to make the page look pretty and a short summary about the book. I keep this blog especially the children’s book section as a useful resource for other parents who might, like I, be bewildered at the book store or the library, searching for something memorable to read with their child. There is another rather selfish reason. I document what I read to store precious memories of what I read with my three year old… what the books were about… but most importantly what our reactions to the book were. I like to imagine her in the years to come scrolling through these blogposts (and not totally obsessed about painting her nails and other ‘teenager-like’ things) and reading about our book adventures. I hope she will grow up to love reading as much as I do. Books are the best companions… well next to people. Here is a memory from the book ‘Corduroy’ by Don Freeman. 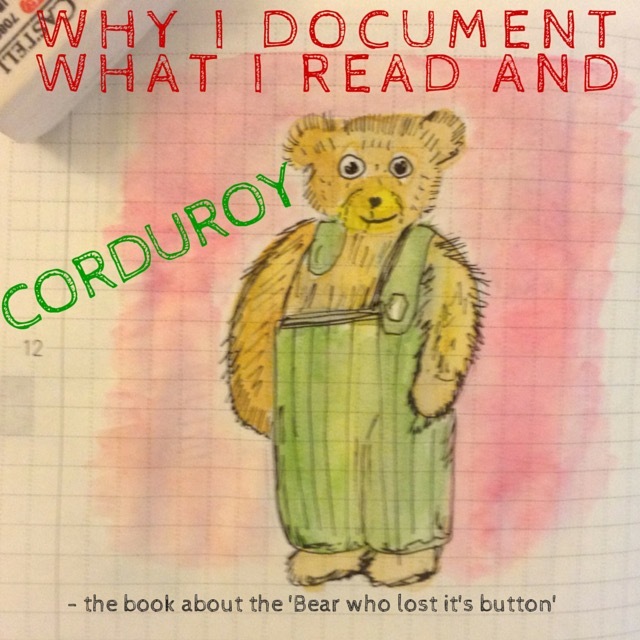 A little bear called Corduroy lived in the toy department of a big shop but was sad because no one ever wanted to buy him. One day a little girl called Lisa fell in love with him and wanted to take him home. Her mother said that the bear had lost its button and therefore it was not a good idea. That night Corduroy searched high and low in the shop to find a button. The next morning, Lisa returned and spent all her saved up money on purchasing Corduroy and taking him home. Corduroy for the first time in his life felt what it was like to be loved and to have a home. Lisa even sewed on his missing button. Little M had read this book before. Her reaction to the book? “It’s the book about the bear who lost his button”. Her Father who is not up to speed with ‘all things bear-related’ – asked her if this was the same bear we had gone to see at the cinema recently.